1 Carley sat on the side of her bed holding one of her pet chicks. Her father had made her an incubator. They found someone who had hens and roosters. They bought a dozen eggs for hatching. 2 Some of the eggs were white, some were brown, two were cream colored, and one was green. Some of the eggs were large, and a few were very small. 3 "You should get a variety of chickens from those," said Dad. 4 "That green one is from a type of chicken from South America," said Mom. 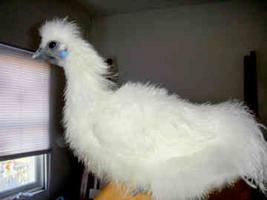 "It is called an Araucana." 5 "What about these small eggs?" asked Carley. "What kind of chicken are they from?" 6 "They are bantam eggs. They are small chickens, so they lay small eggs," said Dad. 7 The twenty-one days it took to incubate the eggs seemed to last forever. Every morning and evening the eggs were turned. 8 Each egg had a penciled "X" on one side. That way they could easily see which eggs still needed turning. One time, all the Xes were facing up. The next time, all the Xes were facing down.